Having arrived a little early (eager beavers! ), we were shown to our window side table, and began taking in our surroundings. 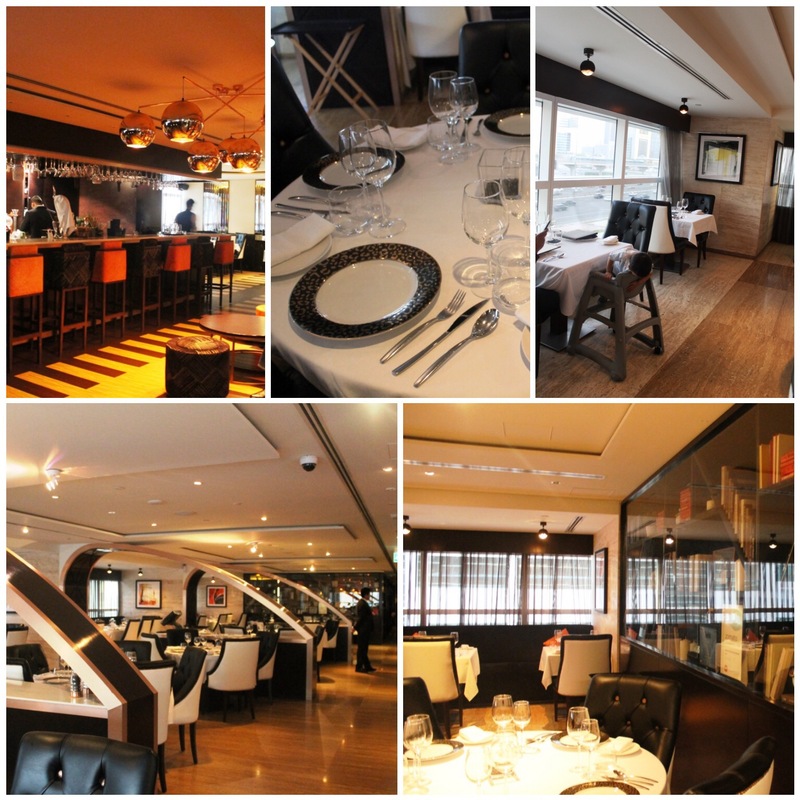 The restaurant is lavish and I must say, has very comfortable seating! There is a spacious bar area at the front, along with a dimly lit lounge area, divided from the main seating by a quirky wall of book shelves and trinkets. 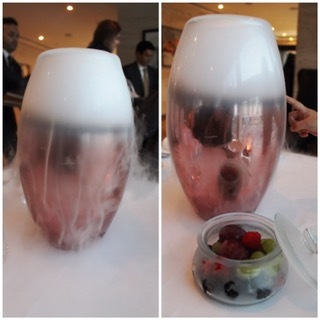 The time for Iftar quickly dawned upon us and our meal began with a show stopper itself, as liquid nitrogen was poured into a vase to get our senses tingling. Baby Z was amazed to see the smoke rising and was eager to catch it between his fingers (as seen in the photo above). This was presented with a bowl of fresh fruits including berries and grapes. I loved that this start showcased what was to come. The starters were brought out swiftly after, presented in the most beautiful manner. The Amuse Bouche included Crudités, Date Candy, Saffron & Almond Milk, Meat fruit, Steamed Edamame and Aubergine Salad. It took every cell in my body not to reach out before the Adhan sounded, and once it finally did, I started off with the Date Candy. It was sweet and crunchy, the perfect start. 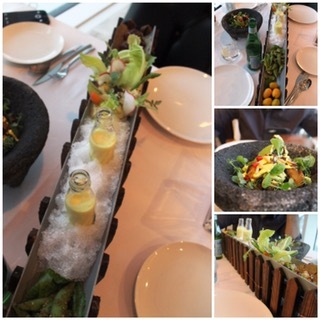 The Crudité was by far both my husband and my favourite from the Amuse Bouche because of its delicious dressing. The Saffron and Almond MIlk was the first thing Baby Z reached out for, and though a little difficult to drink out from the cute little glass bottles, it tasted delicious. The meat fruit and steamed Edamame were equally as good, and the salad was full of texture and flavour. Once we had cleared the starters, our “Volcano” drink was brought to our table, and made to erupt in front of our eyes, Baby Z was once again astounded, and to be honest, so were we. Watching the berries bob up and down furiously in the tall glass cauldron was the highlight of his evening for Baby Z. As the smoke diffused, a range of dishes were brought before us. 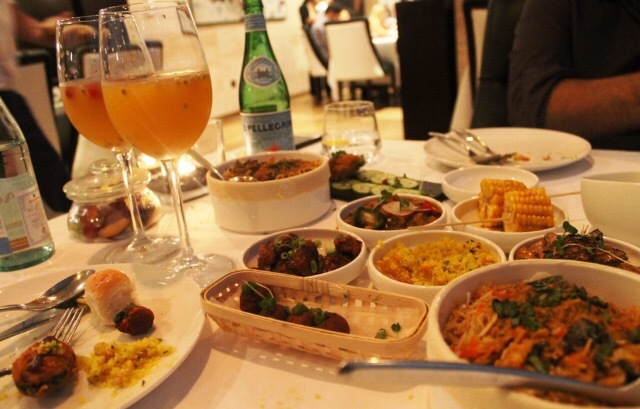 The dishes included two Biryanis: Chicken and Tiger Prawn (with Raita), and an array of sides including Creamed mushrooms, Lamb Kofta, Chicken Kheema, Corn on the Cob, Burnt Butter Cous Cous, Mongolian Beef and Tempura Chilli. 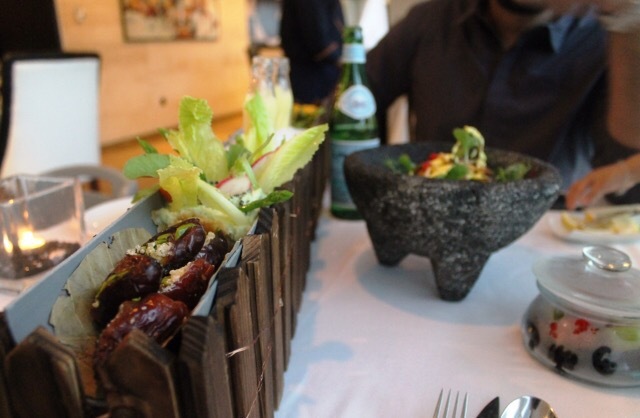 Each dish was exquisitely prepared, of the right quantity, especially considering how quickly one fills up during Iftar, and simply stunning to look at. My absolute favourite were the Creamed Mushrooms, which were sweet and creamy, followed by the Cous Cous and Tiger Prawn Biryani, which had the most humongous sized prawns. The staff were happy to bring Baby Z one more corn on the cob, without any dressing, to suit his taste. My husband’s favourite was the Chicken Kheema, and I also enjoyed the crunch and spice of the Tempura Chilli. 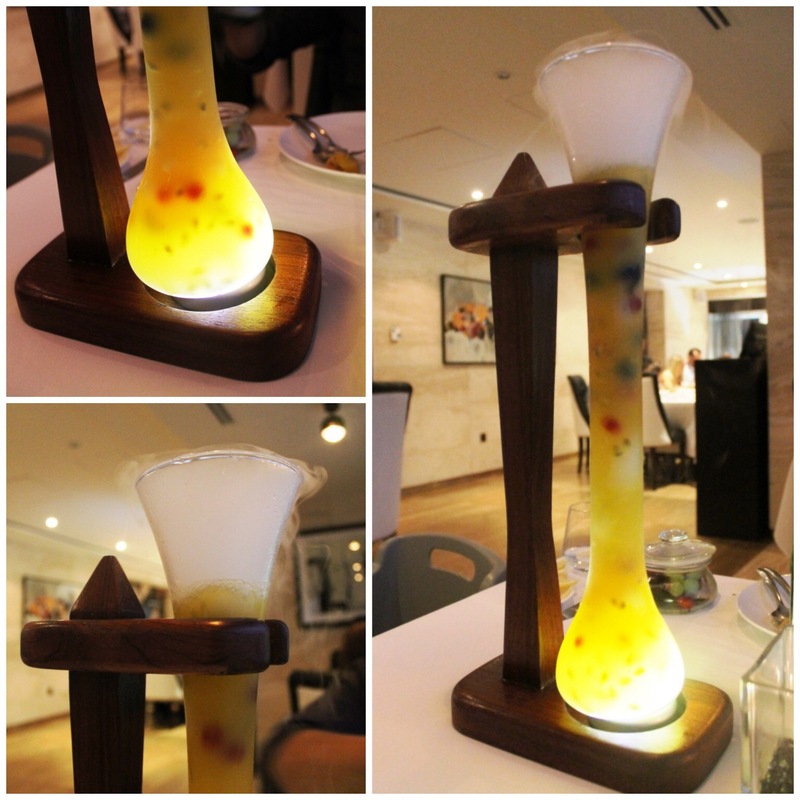 The volcanic drink complimented the dishes perfectly as it was sweet and refreshing. I must admit, I did wonder if my throat and insides would freeze over after watching liquid nitrogen be poured into the Lava Lamp! You will be glad to know that it did not, thankfully! 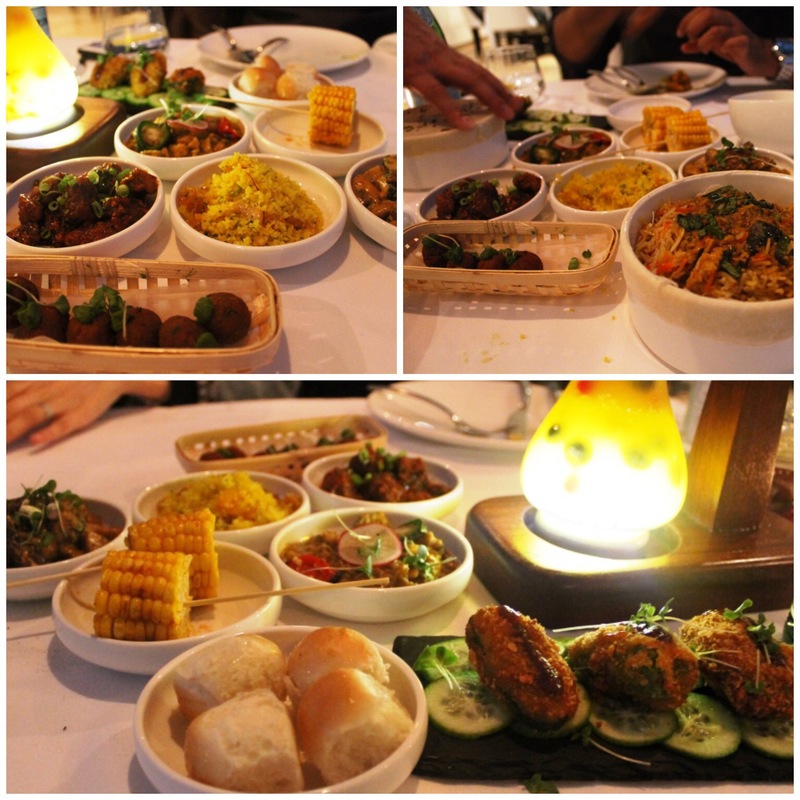 Following the above, four main dishes were brought to the table. 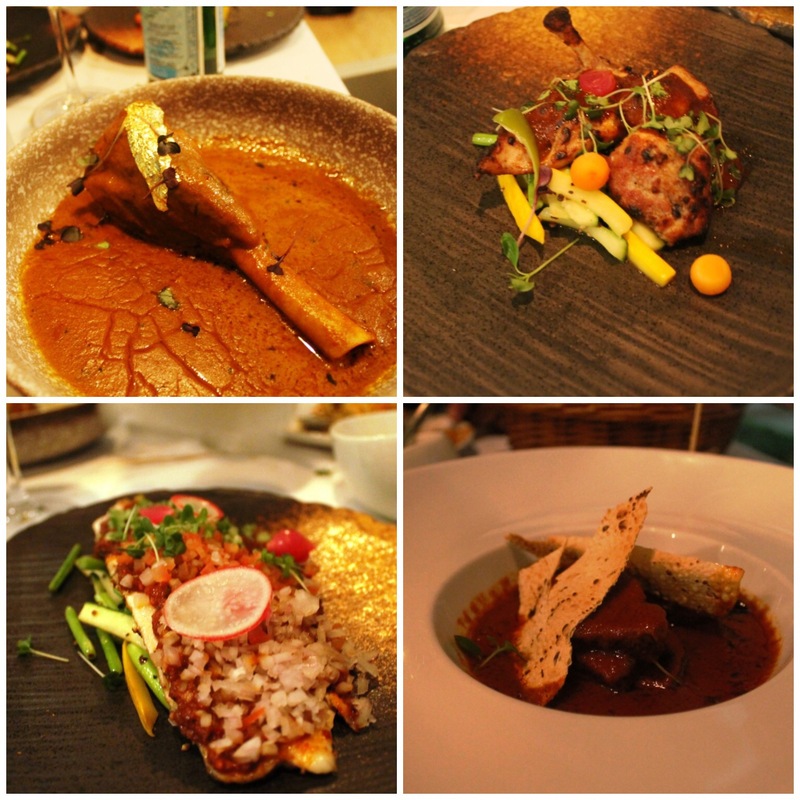 The top right is the traditional Lamb Nihari, complete with gold leaf garnishing, with a rich gravy and meat that was very much falling off the bone. The top left is the Roast Chicken, tender and full of flavour. The bottom right is the Baked Sea Bass, again cooked to perfection, and I loved the crunch of raw onion on top. I did find the flavours a little too sharp for my liking though. However my favourite main was the Laal Maas, tender venison meat that melted in the mouth, cooked in rich gravy yet again and garnished with Papad. We also had a serving of Naan to go with the curries. After devouring the mains, we were brought a palette cleanser in the form of Kulfi Ice cream, with a generous drizzle of saffron on top. Accompanying this was the dessert plate of Mithai, showcasing an assortment of traditional Indian sweets, including two of my favourites: Gulab Jamun and Penda. The plate was garnished with rose petals and gold leaf in a meticulous manner, and I assure you, was wiped clean within minutes. Who can resist such a heavenly offering? Not me, for sure! 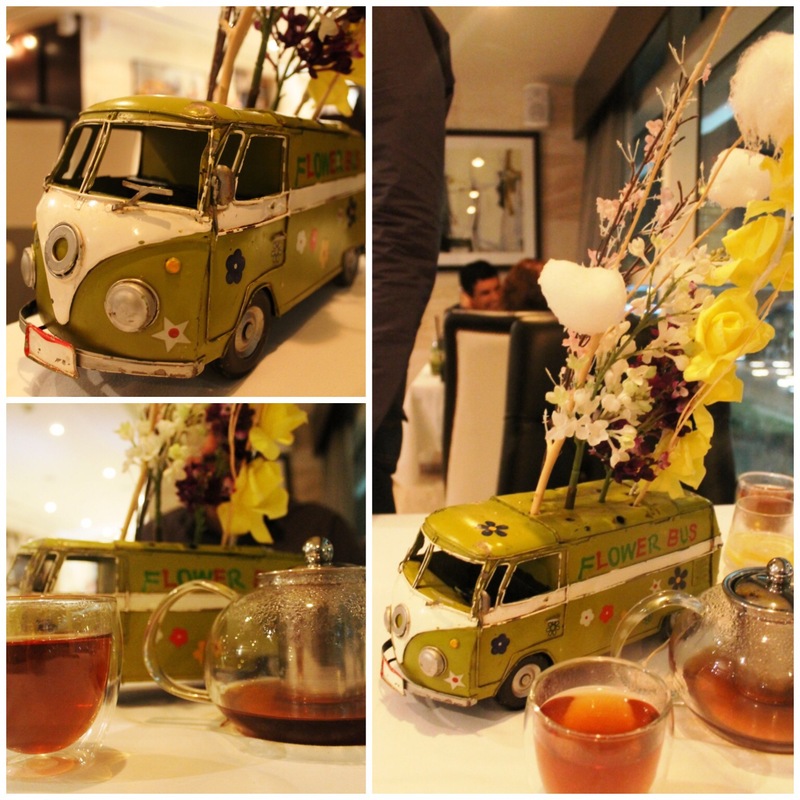 Just as i thought we had seen and tasted it all, a mini van along with our Earl Grey tea, was parked right before us. This was no ordinary mini van though, as it held a bouquet of Pan Flavoured Candy Floss. Who would’ve thought it? You should have seen the expression on our faces as we indulged into the candy floss, thinking it was like the ordinary sweet kind, to have our minds blown as we tasted Pan. Also, does the mini van not resemble the Scooby Dooby Doo Mystery Van? Unfortunately, we had to send it away rather quickly as Baby Z insisted it was something he wanted to drive through the restaurant. I don’t think the guests or management would have taken very kindly to that! And thus, our exquisite dining experience with TrésInd came to an end. I can not recommend this place enough and the pictures above do no justice to the true culinary art presented by TrésInd. It is one of those things you must experience to truly appreciate it. 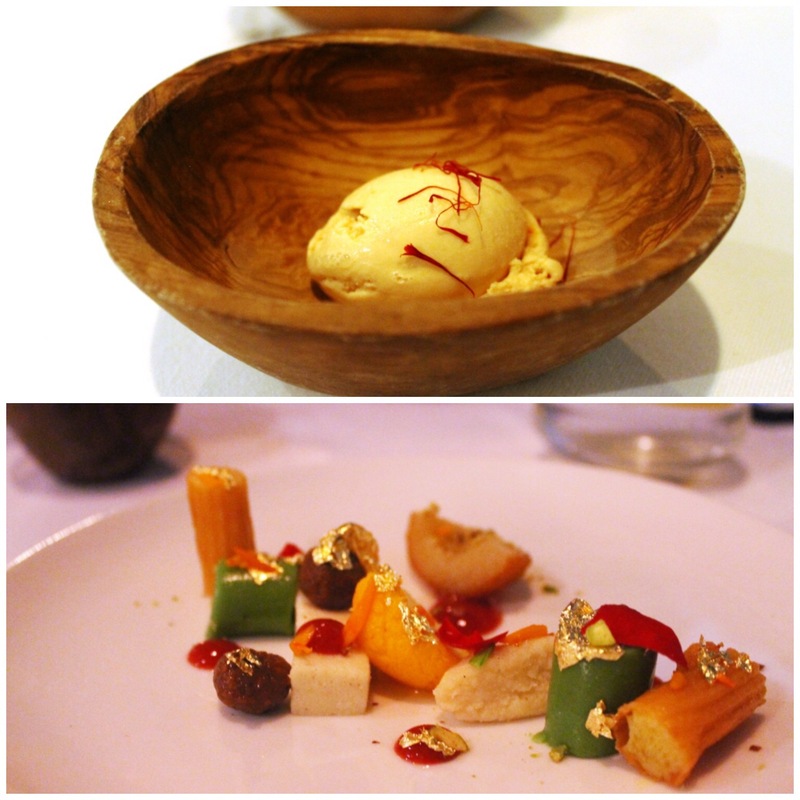 Each dish was a work of Art, if not a masterpiece in itself. Above this, I loved the fact that it was not only our table that was experiencing this, it was each and every table. There were live demonstrations going on around us all the while that we were enjoying our meal, almost as if I was back in my science class during school, because food was being mixed into liquid nitrogen here, there and everywhere! It did make me rather curious as to what the other were eating, whilst secretly promising myself that I will be back for that dish. I can’t recall a single table that was empty as we left, so if you are interested in experiencing this truly unique Iftar and Suhoor experience, I suggest you make a prior booking. 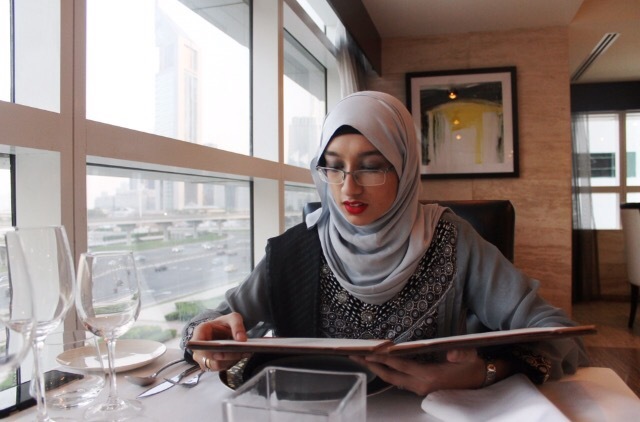 The Iftar meal is understandably a little pricey at AED 200 per person, but is it worth every penny, or Fils in this case, YES it absolutely is. 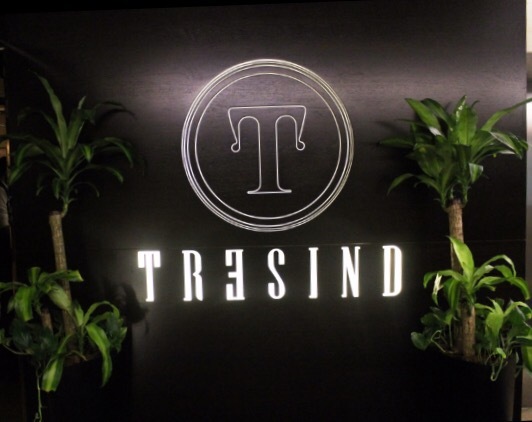 You can find out more about TrésInd through their website: www.tresind.com, or follow them for updates on Facebook, Instagram and Twitter. 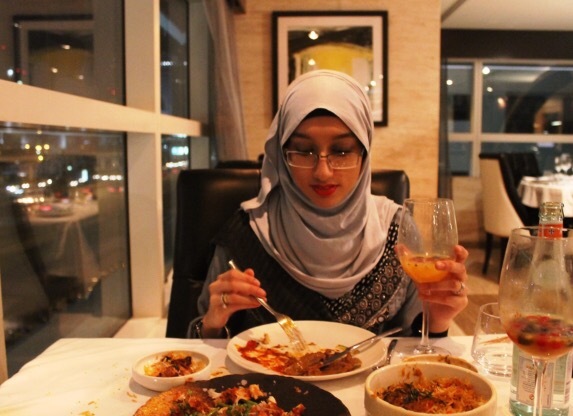 Lastly, I leave you with a short video recapping the highlights of my Iftar at TrésInd. Enjoy! Note: I was invited to review the Iftar Menu, however all views and opinions expressed above are honest and solely my own. I love the presentation of the food, and the interiors! Must have been a wonderful experience. 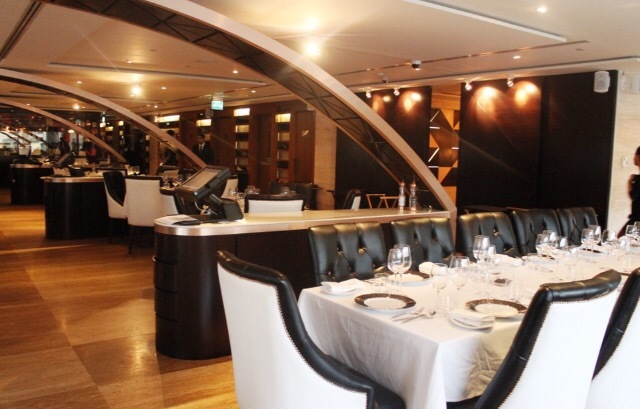 It really was such a unique dining experience to anything I’ve had before! Hehe Oops! It really is a must try though! It absolutely was! Thanks for stopping by!